This is what I think is a Megrim sole or Whiff (Lepidorhombus whiffiagonis) a species of flatfish. In Spanish we call it Gallo, the French call it Cardine and Italians, Rombo Giallo. It is also referred to as white sole or lantern flounder. 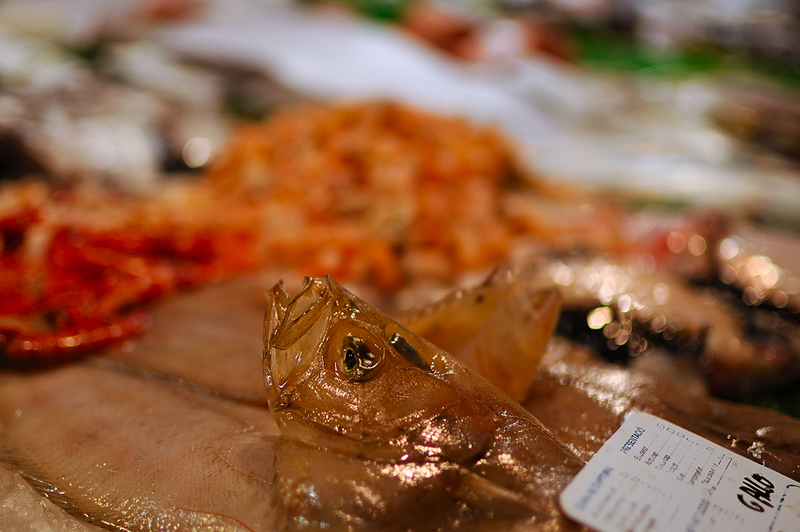 I mentioned a totally different fish called Gallo before in Barcelona Photoblog. Well, what's in a name. The point is I am always attracted by the looks of market food, of dead animals displayed kind of artistically to lure customers. I hope this still life portrait serves taxonomists and food enthusiasts alike. Before I say goodbye today let me tell you that megrim is inexpensive and quite good for soup. Although it is not very tasty, it can be served filleted along with other ingredients. Try this recipe: Megrim with Prawns and Mushrooms. "[D]ead animals displayed kind of artistically to lure customers" and "serves taxonomists and food enthusiasts alike." Interesting photo, and thanks for the recipe! Vibrant color and great recipe!